As America moved into the “Roaring Twenties”, the automobile became an important part of the every citizen’s life. The car became more affordable for the people with the average income. Automobile production figures rose from two million in 1920 to five and a half in 1929. By the late twenties a point was reached at which it was possible to move the entire population of the United States by road at one time, since there was close to one motor vehicle for every five people. Thus the car was no longer a luxury, but a useful and necessary item of the household. Motor-vehicle manufacturing was by then the largest industry in the country and was still growing rapidly. Employment in the automobile factories was a quarter of a million in 1922 and in excess of the 400,000 in 1929; the amount of paid wages doubled from $400 millions to $800 millions. It also had a great effect on other industries: highway construction, retail, repair and gas services. These industries employed about the 1,2 million people. The motor vehicle was now consuming annually 90% of the country’s petroleum products, 80% of the rubber, 20% of steel, 75% of the plate glass, and 25% of the machine tools. Of course all this automobelization of a such huge country as USA required reorganization of a whole highway system in order to provide motorists with usable ways of transportation. In 1916 the Congress passed the Road Aid Act by which all state governments were required to have a highway department to keep state roads in order. But new Federal Highway Act of 1921 went even further by providing states with the federal help in maintaining of the roads of the federal importance (about 7% of the non-urban road mileage in each state) on a fifty-fifty matching basis. Initially about two hundred thousand miles of trunk highways received federal support. In order to justify these expenses Oregon’s state government used simple and apparently painless method of taxing the sale of gasoline in an amount of one cent per gallon. Ten years later every state had gasoline tax, and the average had risen to three cents per gallon. During this time the automobile industry was undergoing fundamental changes in structure. The day, when the individual with technical skills and a garage could start a motor company like in the beginning of the century, was gone. In order to gain the mass market the company had to have a tremendous capital, great manufacturing facilities and widespread network of dealerships. Thus during this time the so-called Big Three consolidate about three-fourth of the market, leaving the remaining 25% to about 50 other companies. So this Big Three consisted of Ford, General Motors and Chrysler. 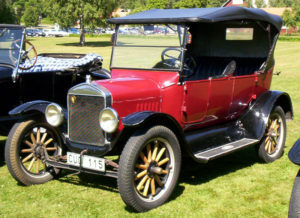 At the beginning of the boom period of 1920’s, Ford’s leading position was unchallenged and seemingly unchallengeable; in 1921 the Ford Motor Company made three-fifth of all the motor vehicles manufactured in the United States. But soon General Motors moved it from this position. Henry Ford (the founder of the Ford Motor Company) contributed a lot to his own defeat. He stubbornly refused to see that the assembly line (his innovation) and the Model T (his first car) were merely a step in the progress of the automobile and not the culminating stage. The problem with Tin Lizzies (Model T) was that they were produced almost unchanged from their prototype of 1908. Henry Ford obviously missed the fact that more attractive and more comfortable cars appeared on the market, and low price (Model T was the cheapest one) wasn’t a solution to everything. The price from now on became just one, but not the only one, of the criteria for the consumer’s decision. On May 31st, 1927 the last Model T (No. 15,007,003) rolled off the assembly line and all Ford manufacturing operations came to a prolonged halt. This was the result of final realization of the inevitable Ford was loosing to the General Motors, and it needed something new. For about a year and a half Ford was keeping silence, but finally he came out with the Model A. Although it was a good car, and in its first year it outsold General Motor’s Chevrolet, but it wasn’t significantly different from its competitors and certainly not superior to them. Thus in spite of all Ford’s effort his company would remain on its second place till nowadays. General Motors was founded by William C. Durant in 1908. General Motors was the major Ford’s competitor and was able to defeat Ford’s Company not only due to the Ford’s mistakes but also because of Alfred P. Sloan, Jr., one of the greatest organizing geniuses in the American industry. After Durant bought Sloan’s business, which was pretty successful, Sloan came to work for General Motors too. Soon he was promoted to vice president and became president of the General Motors in 1923. In 1920 General Motors began to experience big troubles with quality control and sales. William Durant was forced out of his job and Pierre Samuel DuPont took his place. Sloan was in charge of operations at the time. He had to reorganize the whole company because management team was unorganized. Few different lines of cars were produced: Chevrolet, Oldsmobile, Buick, Cadillac, Pontiac, La Salle, and more. None of them had production planning but they all competed among each other. Only Buick and Cadillac were known for quality. Company had noinventory control. When Sloan familiarized himself with the mess in the company, he realized what the company could be if it was organized. He noticed few main advantages over Ford: General Motors had variety of cars when Ford only had Model T in production, also GM’s car were in different price ranges. GM started making cars with 4, 6, and 8 cylinders. He established inventory control, and discontinued any line of cars which wasn’t popular with consumers. Also he formed a policy of annual model changes to attract customers. Also he set up advertisements and banquets to help him sell cars. In 1921 General Motors sold 457,000 cars and their profit was 61 million dollars. Next year 800,000 cars were sold and profit was 80 million dollars. President DuPont was so pleased that he retired and named Sloan the president of General Motors. In 1929 the profit of General Motors was 248 million dollars with 1.9 million cars sold. During the Great Depression sales dropped by a lot but General Motors still made a huge profit compared to all the other companies because the company so organized under Sloan that it was able to adapt fast to any major market change. When Alfred Sloan took charge of the General Motors, company was a mess and was on the edge of collapse. Alfred Sloan basically made General Motors the company that became first on the market and kept that position . At the next level below Ford and General Motors, when the 1920’s began, was a group of apparently well-established companies with some potential: Hudson (including Essex), Studebaker, Dodge, Maxwell (later Chrysler), Willys-Overland, Nash, Packard, and Durant Motors. From these only Chrysler emerged to form what became one of the Big Three of American automobiledom. This was the result of a conscious decision on Chrysler’s part, along with an ability to grasp opportunities. He was aware that, despite its promising start, the Chrysler Corporation would be a minor and possibly short-lived member of the automotive world unless it could get established in the mass market. But the manufacturing resources were too limited to enable Chrysler to produce a low-priced car competitively, and the company still lacked the financial strength to build a new plant on the scale that would be required. The solution to the problem was found when the Dodge Brothers Manufacturing Company was put on the market in 1928. John and Horace Dodge had been victims of the influenza epidemic that followed the First World War, and their heirs subsequently decided to get out of the automobile business. Consequently, after some dickering Dodge was absorbed by the Chrysler organization. The assets received by Chrysler were just what he needed: a first-class manufacturing plant with a well-equipped foundry and other facilities for large-scale production; a car with a well-known name and an established position in the medium-priced market; and a dealer network some twelve thousand strong that could be used as an outlet for other Chrysler products. The Dodge sales organization was considered to be one of the best in the country, and Chrysler’s autobiography makes it clear that he wanted the Dodge dealers as much as the Dodge manufacturing capacity. With these resources at his command Chrysler was able to introduce the Plymouth in 1928, a step neatly timed to take advantage of Henry Ford’s temporary disappearance from the mass market. With the rise of Chrysler the developing structure of the American automobile industry became clearly appreciable. At the top were General Motors and Ford, between them outproducing the rest of the industry put together. Both were also international automotive powers. Ford had established manufacturing subsidiaries in Europe before the First World War and had regional assembly plants throughout the world. General Motors bought the British Vauxhall and the German Opel companies during the 1920’s. Chrysler was well behind the leaders but definitely ahead of the rest of the field. The total effect of the motor vehicle on American life has still to be measured, if indeed such measurement is even possible. Certainly the automobile brought major social changes, and some of these were becoming evident with the widespread extension of car ownership in the 1920’s. It would be an exaggeration to say that the automobile made Americans a mobile people; the people who made their way across the American continent while the motorcar was still a dream were far from static. It would be more accurate to say that an already mobile people was given the means to travel farther, faster, and more freely.